Near the edge of the woods is a circle of trees on a small rise. It is not far from the path, but it is covered in bramble and thorns, and the steep slope makes it unwelcoming. But those who venture up and into its midst will find a small, well-fitted door in a stone opening set in the ground inside the dished center of the circle. This leads quickly down underground, and then along a long, straight path leading to a procession of hundreds of stairs that lead up (presumably under the rise of a hill a half mile away, across the fields) ending at a landing with an alcove to one side and a stout wooden door a few feet beyond. The magics that were used to enchant the creatures who dug the chambers of this dungeon did not bind them as closely or as precisely as the wizard had hoped. Although the instructions they were given were straightforward, they could be misinterpreted And so, the complex took on a strange configuration of unusual hallways and misshapen rooms. Odd corners and alcoves aplenty turned out to be especially fitting and useful to the new inhabitants. But do some odd traces of that magic still linger in the stones of the dungeon? For those of you who were interested in it and want to get a copy for yourself, printed copies of the Exquisite Corpse Dungeon are going to be available. The first release is going to be distributed in an upcoming Mythoard bundle coming this summer. This also marks the soft launch of Antherwyck House Games as a publisher. We’ll also be offering copies of the ECD available directly from us, as well as an option for a premium version on heavier weight display stock. But for now, we aren’t set up yet for online orders. If you’re interested in news about when that will become available, sign up for our TinyLetter newsletter, and we’ll be certain to announce when we’re ready to start shipping these. 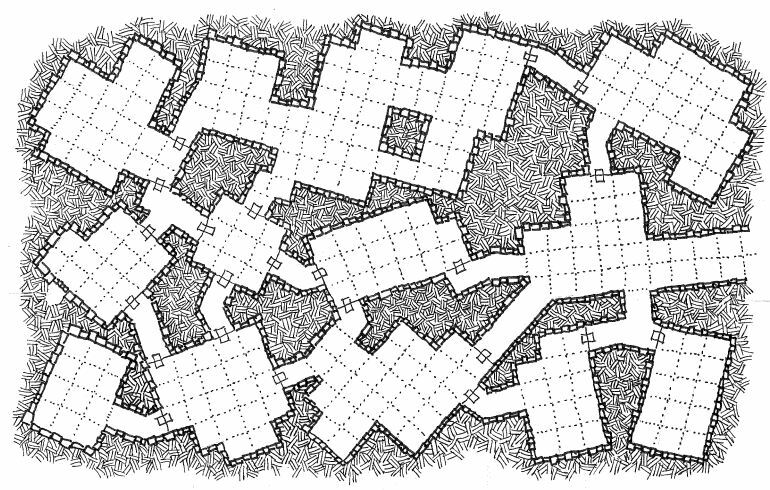 The map of the dungeon has turned out to be 3′ long when printed. It’s far from your average dungeon, especially because the terrain keeps changing as you go from one section to the next. Also, there has been enough interest that there will be another Exquisite Corpse Dungeon starting some time this summer. Once again, we’ll have word about that in the newsletter, and the main discussion will also probably center on Google+, where the whole thing was hatched in the first place. 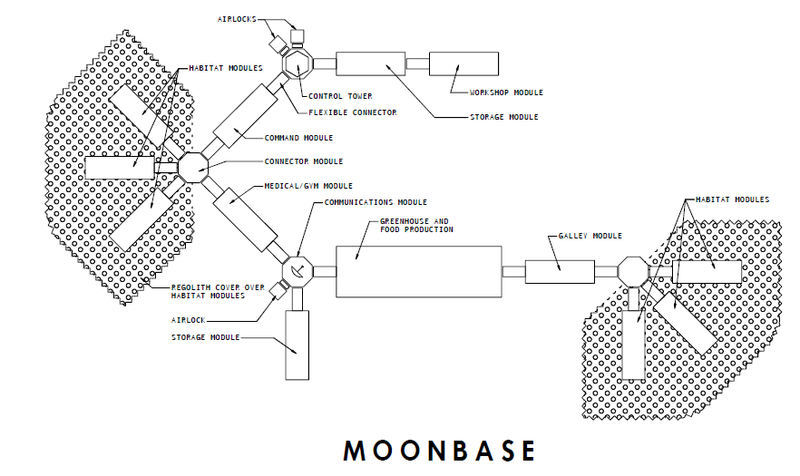 There was good feedback and discussion about the Moonbase map from the Google+ groups. This is a summary and accumulation of those questions and answers. The idea of making this into a setting or a game has been kicking around for a long time, and it’s not likely to go away. And the feedback from a few people about this being posted on G+ was positive and interested in seeing more about it. Some of the inspiration for this came from proposed concepts (both US and USSR) for moon bases. The principal reason for regolith cover seemed to be for radiation protection. It probably would provide some insulation benefit (principally sun shading), as well. Presumably the base is there for activity on the lunar surface, so some surface access is needed. And the greenhouse obviously can’t be covered. But also, all that work is presumably time consuming and difficult, and EVAs are better spent on useful activities. The modular nature of the base allows for future additions, which would be much more difficult with having to excavate and then re-bury modules in order to access them to add on. Also, the habitat modules would likely need to be structurally reinforced in order to support being buried. Other modules could be lighter if that wasn’t required for them. Habitats provide 50% coverage (figuring that sleeping and personal time being roughly half the day) so it’s a trade-off between exposure and utility. A couple others joined in on discussing the medical module. The idea for this was that it would be principally a medical research and health maintenance space, rather than a treatment facility. It would not be a “sick bay” for recuperation and invalid patient care. It would have laboratory and medical diagnostic gear. It’s more of a medical research and health maintenance space, rather than a treatment facility. Thor has been working on a variant of Pyramid, and that may be something we’ll be sharing soon. This is here to be an initial announcement and to keep a link for the source information. This map started out with an idea for having fairly regularly orthogonal rooms, but not necessarily orthogonal to one another, and that got carried through pretty rigorously. Each of the hallways had to be square to its room, which then meant that each hallway had to have a single break where the hallway transitioned to the hallway for another room (though there are a couple places where that wasn’t carried out that way). The lines are also better in this, and I think the fougou-like walls stand out more strongly than previously. I also like the way the secret room is worked in to this. Whether it would just be a door (though it isn’t drawn like that), or whether it would be necessary to take pieces out of the wall in order to have access to the small space beyond, the idea of this small, hidden bolt-hole is suggestive of a number of possibilities. 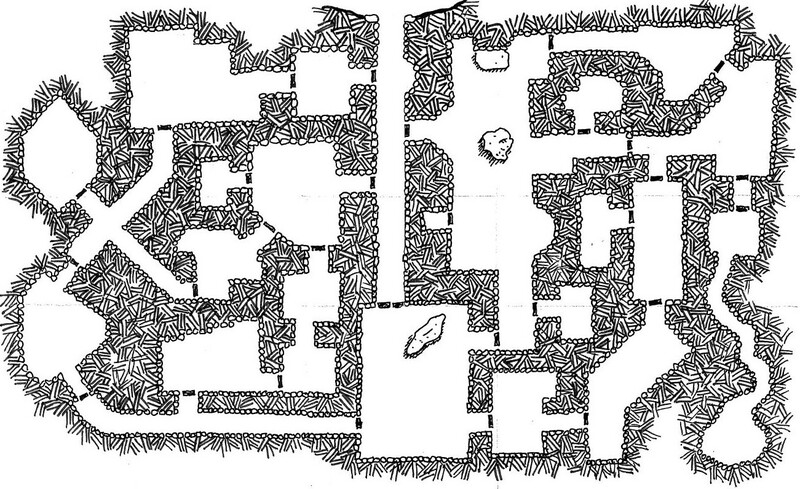 This was designed, in part, with an approach to making an Un-Furnished Dungeon, and I think this might be the next in that series. As usual, feel free to use for any non-commercial purpose, or contact me if you’d like to use this on a commercial project. There was definitely a wave of excitement about the Exquisite Corpse Dungeon when it was unveiled last week. It’s amazing how much interest this weird little project has drawn, but it’s also not surprising, given the talents of the contributors. Several people have asked about the possibility of a second round, both from the group who participated in this one, as well as a some people who weren’t able to participate in the first one or those who have discovered it after it was finished. It’s pretty obvious that there’s more than enough interest in doing this again, and so the question is going to be when and how, rather than whether to do the next one. For now, if you are following this blog, or if you’re following me on Google+, then you’ll probably be aware when ECD II starts rolling. There will likely be a separate discussion group for it when things start to ramp up. You could also sign up for the fledgling Antherwyck House TinyLetter, and we’ll certainly be including updates there, as well. A couple people really want to use the maps and turn it into something more, adding descriptions and so forth. I’m all in favor of the idea, personally, and the map is CC licensed [CC BY-SA 4.0], so you are free to use it according to those terms (as long as you are keeping the credit for the original contributing artists intact and allowing derivative works to be likewise shared). The premise behind the Exquisite Corpse process is one of contribution when you don’t know anything about the other contributors’ work. So, I wouldn’t think that there’s a one-to-one matching way of doing a writeup for it. I’m not planning to organize that part of it, myself, but I’d be glad to help facilitate the discussion, and see if something more could come of it. Also, it may be a little early to mention this, but there is likely going to be a print version of the Exquisite Corpse Dungeon. We are looking into getting a couple hundred copies of it printed for a small distributor! So, this is going to have an ever wider reach than any of us expected going into this project. Ideally, if everything works out, the plan is to produce these copies as a scroll. But, if that’s not going to work for shipping, then we’ll have to end up folding them flat. Either way, it’ll be cool to have an even wider audience for it. If this all works out, we could also potentially sell copies directly from Antherwyck House. We are working on getting Antherwyck House up and running at RPG Now/DriveThru RPG, but the format of the ECD map is not something they are able to do, right now, so we would have to do the printing and shipping & handling for this ourselves. The name for this came while I was still drawing it. Strange rooms and niches that definitely suggest a sense of something else that is going on. As with a lot of these, there aren’t any doors indicated, but it is easy enough for a DM to put a few doors in here where they would find them to be most useful. If you’ve been following the project and the discussion over on Google+ this past month, you may have seen some of the discussion going on about the Exquisite Corpse dungeon, or you may have caught one of a number of excellent mapmaking artists mentioning their participation in this project. But there’s been little to see. But now, earlier this week, the last of the twelve segments of this dungeon was completed, and the whole thing has been put together to yield this rather amazing map. This has been a remarkable project. Many of your favorite artists creating maps and dungeons and maps for games got together and produced this massive collaboration. 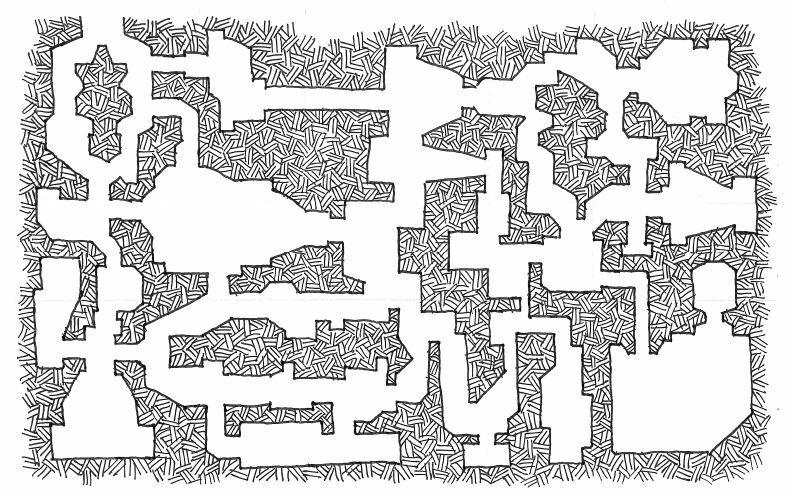 This is a dungeon made up of 12 segments, each drawn by a different artist, who knew nothing about what had been done before other than the last little bit of the preceding segment that someone else had drawn and that they were connecting to. As it was spelled out at the beginning, an Exquisite Corpse is a blind collaboration project, where each contributor knows little to nothing about what has already been done on the project, and only has a few threads of connection to use as their starting point. Most of the artistic exquisite corpses I’m familiar with run just 3 or 4 contributors, so the 12 person version is quite an undertaking. What has struck several of us about it, already, is how some elements seem to carry through in areas, although none of it was coordinated or pre-planned. 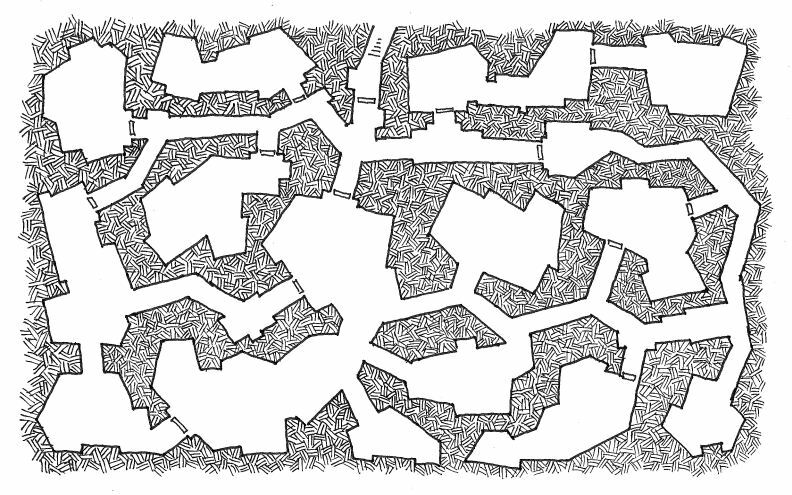 Each contributor was asked to draw a segment of a dungeon 30 squares wide by 12 squares tall. They knew nothing about what had been done before, other than that each of them was given was a copy of the bottom row of the previous segment (so they knew where to make the connections). It’s been a lot of fun having this group collaborate in this way, and everyone has been dying to see what the whole thing looks like. But, of course, it’s been necessary to keep it under wraps until it was done. It was worth the wait, and the excitement has been building leading up to this. Thanks, once again, to all who participated in this project. It turned out magnificently. There are a couple larger versions of this, if you want to have a closer look. A full-height PDF (36 inches tall) is pretty sizeable (over 8Mb). 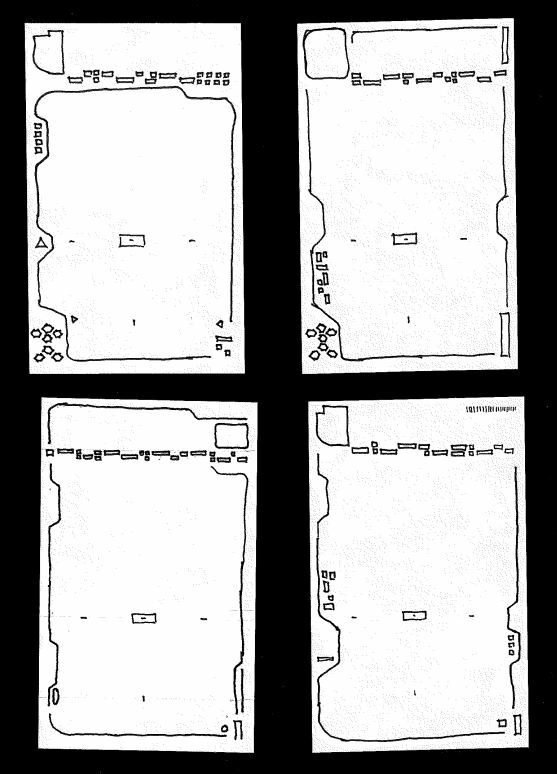 There is also a 3-page version which breaks the dungeon, but which should fit on regular 8-1/2″ x 11″ or A4 pages. After doing a few plan geomorphs, I thought it would be interesting to see how some section geomorphs would go. So, in this set, 4 of the 6 are sections (although the Escher-esque one, bottom center, could be used as a plan just as well). These are less successful than the plan ones, I think, but some of the ideas are fun, even if the execution doesn’t quite follow through. 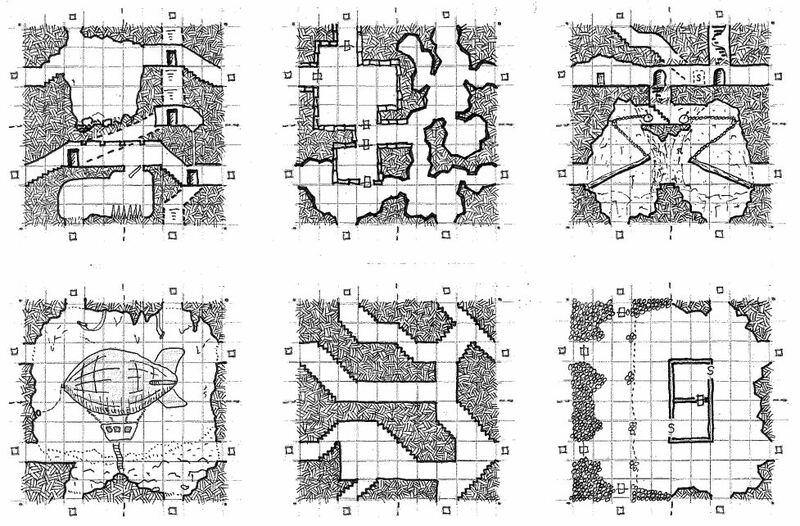 Updates on a number of different projects including the Exquisite Corpse Dungeon, Blank Cards and Un-Furnished Dungeons, and The Wilderness Adventure and DragonQuest. And, maybe fittingly, this is the 100th post for this blog, too. 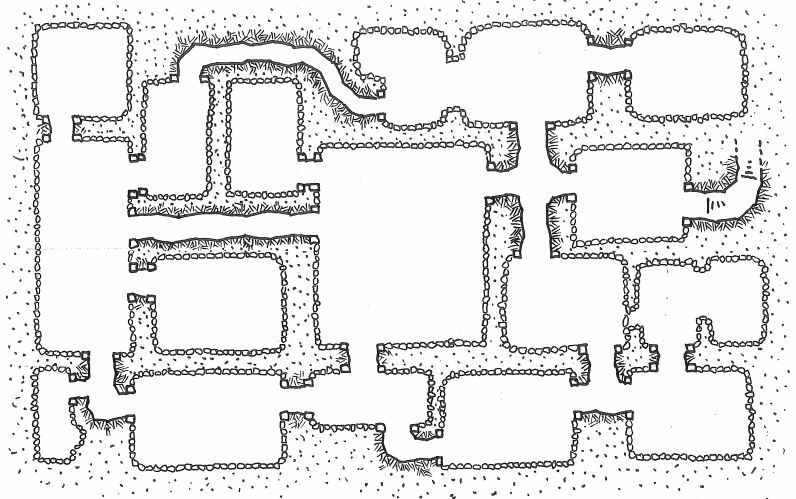 This is another variant on the fougou-style of mapping (see eg previously), along with a different sort of hatch pattern that doesn’t overwhelm the detail in the walls. The stair marks are, I think, backward from what is conventionally used to note stairs leading down (presuming that this is a warren of underground rooms with one passageway up to the surface and not something weirdly being accessed from below). There is a kind of secret door implied in the lower right, where there is a wall that covers over an alcove directly behind. If that large stone was on a pivot or hinge, it could be a secret passage. Even if not, it could be something that adventurers could discover and pry open, if they were so inclined. No doors are shown in the plan, but there are jambs that could be doorways at the transition points between rooms and the more tunnel-like passageways. I’m starting to have fun with these. Here are a couple first drafts of a science fiction version of a certificate card (this is sized for a poker-size card). There will probably be a print & play option for these, as well through my Patreon. Stay tuned for that, too, if you’re interested in that option. Presenting a couple of real rough sketches for the idea for the scifi cards. (This is the kind of behind-the-scenes that should be in the Patreon for higher levels of support, but for now, it may be more useful to share this widely so that everyone can see the kinds of things that you might have access to.) For now, I’m looking for feedback on the general direction and gauging any potential interest in these if we do go to press with them. Are they sufficiently science-fictioney skeuomorphs? After screwing around for a while, I think they are, but I’m looking for other opinions. Are there any parts that you like that ought to be repeated in one set or the other? Or things that should be left out because they aren’t really working? I’m thinking of things like the teeth on the side in the BSG* set or the little pseudo bar code in the upper corner of the curved corners set. Do you like or dislike the hex figure in the bottom left? Any other things you like or dislike to tighten these up a bit? The other thing to explore will be whether it’s better to have these done as poker-size (or possibly later this year as tarot-size) cards, or if having them printed locally and then doing distribution ourselves would be the better way to go. *probably can’t call the final version BSG, but it’s got the clipped corners, so you know what I mean. Too bad, too, that we couldn’t get them made with corners clipped like that rather than the rounded corner die cut. Sometimes, a 10×10 grid isn’t big enough. Geomorphs are lots of fun, but it’s hard to find room to turn around in one. So this is a double geomorph, using a 20×20 grid, and allowing two standard (ie 10×10) geomorphs to connect to each side of it. Of course, I had to play around with all this room, and ended up trying to overlay two levels (with mixed success). The simple line/dashed line can get confusing to read. Adding the hatch to it helps somewhat, but it still is a bit confusing when spaces in the two levels overlap. So this needs some more work to be really clear, but I think it would probably be okay as it is; there are just a few places where you have to look at it to make sure you’re following what’s going on. Anyone have any suggestions for next steps? This past week, Dyson Logos posted a really great image for a 3×5 Index Card Magic Item Certificate, and there was some discussion on G+ about getting them printed for use in a game. I haven’t seen anything further about that idea from Dyson, yet. Also, in that discussion, Jay Exonauts expressed interest in a scifi version, and a couple others said they would be interested in buying something like that (either the fantasy version of a scifi version). That seemed like something that Antherwyck House could produce and sell, and after a little checking I think we could offer a deck of 50 for around $5 as a POD offering (plus shipping, of course). 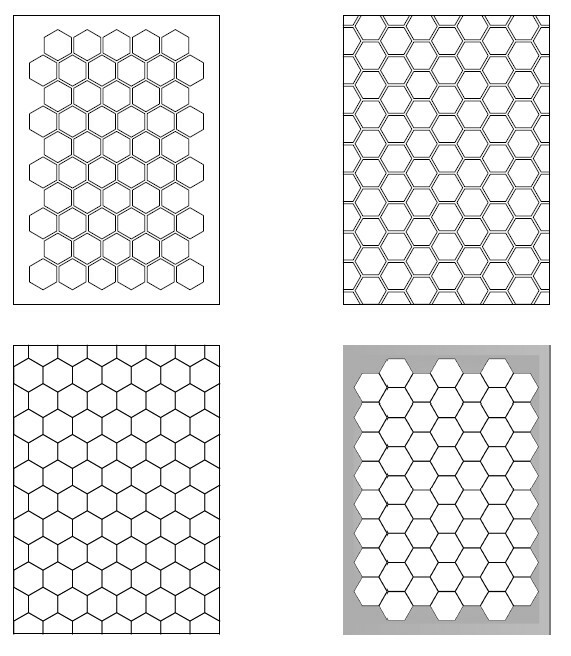 I’ve put together a quick set of options for the backs of the cards (which might also be usable in their own right, if you like hex maps). 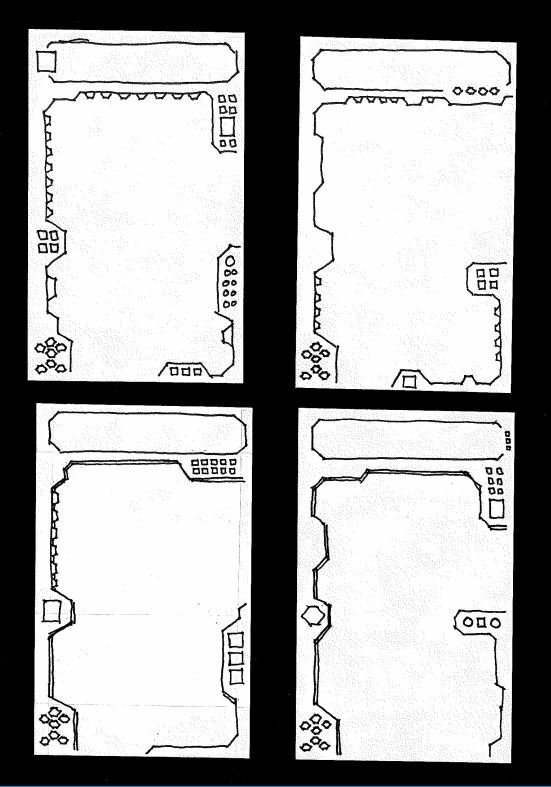 The finished cards would be 2.5″ x 3.5″ (standard poker/playing-card size), but would have rounded corners (rather than the simple rectangles shown here). They could either be full bleed, with the images going all the way to the edge of the card, or they could have a border. A couple examples of each are included. 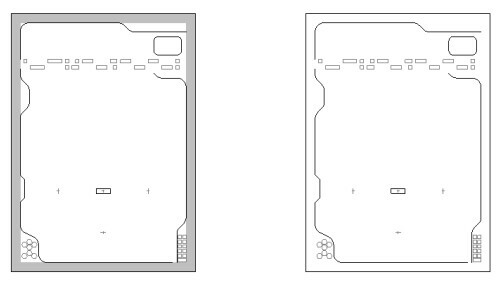 If you’re interested in these, let me know what you think about these options for card backs. Would you want them all to be identical, or would you want to see a mix of a few different backs in the deck? Likewise, for the fronts, do you want to see a set of all the same cards, or do you want a couple different options to be included (whether that’s different styles of art for them, or just printed in a few different colors)? Feedback here is, of course, very much appreciated. If you really want your vote to count, consider supporting my Patreon (which hasn’t really formally launched, as yet, but you can get in on the absolute ground floor if you think this is something you’d like to see).